(SPOILERS) It isn’t as if Dracula origins stories are anything new, or making him sympathetic come to that. Coppola went there in the prologue to his half-interesting, half-cocked Bram Stoker’s Dracula in 1992. 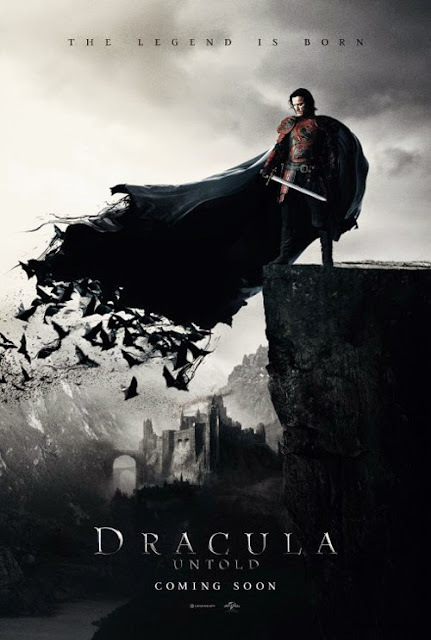 Now, though, with franchise heaven and hell beckoning rich rewards to those who get it right, here’s a full-blown hero yarn, in which Dracula/Vlad the Impaler is a righteous, noble and well intentioned if not-quite-good guy, not dead and loving it until towards the end. Dracula Untold is a sloppy mess, suggesting Universal’s rebirthing of its classic monsters will run aground in much the same way hopes of Van Helsing kicking off a new round of Universal monster movies floundered more than a decade ago. Universal isn’t alone in trying to get on a bandwagon of classic properties/characters only Disney/Marvel seem to have wholly mastered. Certainly, Warner Bros is floundering with DC, and Paramount got stuck with Star Trek, and Sony had to call in those who knew how with Spider-Man. It doesn’t look like a good sign that those who helped run Trek aground (Alex Kurtzman and Robert Orci) are signed up to unleash the new Universal classic monsters powerhouse. The Mummy (last seen 2008), Van Helsing (2004) and The Wolf Man (botched in 2010) are in the offing. Kurtzam was attached as The Mummy as director last time anyone checked. Whether Universal rethinks this in the light of Orci being dumped of Star Trek III is as yet unclear, but Kurtzman does at least have one feature credit to his name. Which is one more than Orci. Dracula Untold happened before all this planning, but its ending fastidiously ticks off the sequel options. It’s doubtful anyone will be pursuing them as no one much cared for the result (although it was medium budget, so anything’s possible; Luke Evans’ stock as a leading man is likely limited, however). Commercials director and first timer Gary Shore does no better or worse a job than others churning out similarly identikit dour colour-washed fantasies but (say) Robert Stromberg made a lot of money for Disney with Maleficent. The main culprits here are script writing duo Matt Sazama and Burk Sharpless (his real name), who have somehow lined up further dubious fantasies with Vin Diesel (The Last Witch Hunter) and Alex Proyas (Gods of Egypt; Proyas was originally attached to Dracula Untold when it was Dracula Year Zero and Sam Worthington was going to star – yes, it could have been worse). On this evidence, they’re story-fashioning skills are basic at best. They redefine Vlad as the victim, characterised through a wimpy voiceover from his son (Art Parkinson, alias Rickon Stark; not the last Game of Thrones alumni pilfered here). Villainous Turks take Dracula as hostage as a wee lad, raising him as their own. Under their instruction, he commits unspeakable acts (hence the impaling epithet) but wished he hadn’t and absolutely doesn’t want his own son to be carted off in turn. To this end Vlad comes up with scheme that is, by any standards, hopeless. The Turks, led by Dominic Cooper, surprisingly, and various other actors who don’t seem remotely Turkish (most notably Thor Kristanjsson) intend to wreak bloody destruction across fair Transylvania, so Vlad fetches himself off to Broken Tooth Mountain where he drinks the blood of vampire Charles Dance (Game of Thrones; Paul Kaye also pops up). Dance is great, and lends a bit of conviction to otherwise puerile writing. Vlad must resist blood for three days or he’ll go full vamp, and of course we know it won’t end well. Sure, Vlad’s desperate, but he clearly hasn’t thought this out. For a start, he can’t do much in the way of Turk toppling during the daylight hours so his fighting style is seriously cramped (the rules here seem very flexible, since he’s getting burned through an open tent one moment and the next he’s standing outside in daylight, but that’s the least of the problems). Oh, except at the end, when he controls the weather and makes it really cloudy. Couldn’t he have done that before, rather than wasting entire days? More than that, we see him wipe out an entire army when he first gets vamped up, but then he goes on the run with his people. Shouldn’t he be taking the fight to them? It’s no use moaning about his time almost being up if he’s failed to take advantage of it. Frankly, all the losses that befall his people, and his dear missus (Sarah Gaddon), are his fault. He only has himself to blame. Oh, that must be why he’s such a tragic figure. Evans is okay, but doesn’t have much to work with. Nor does Cooper, who is reduced to throwing silver coins at his foe in a tepid attempt to defeat him. After Vlad turning into a swarm of bats and generally acting like an ultra-moody version of Neo/Man of Steel, it’s a stretch that such an obstacle would even momentarily unstick him. The full-vamp effects aren’t especially dazzling, although the vampire “predator-vision” is okay and there are worthy vampire destruction moments towards the end. Vlad manages not to get killed in daylight again here, unlike his not-so-comrades (he’s a different kind of vampire altogether; he’s got soul). Dracula Untold managed to get a PG-13 in the US despite someone’s arms being chopped off, which is nice. I expect the MPAA decided it was fine, as the was only Turkish. Sazama and Sharpless’ tin ear for dialogue will be fun to hear coming from Vin Diesel in a few months time, and lines like “My fellow Transylvanians” and “Let the games begin” (coming from Dance), and subtitles helpfully informing us “Castle Dracula” suggest they have an uncommonly terrible touch. As for the ending, with Dracula wandering modern New York like Connor MacLeod in need of sunblock (with both Gaddon as Mina Harker and Dance resurfacing), they clearly had in mind a series with an all-heroic Dracula battling really bad dudes, so it will be all for the best if has been stopped in its tracks.